A dental bridge crosses the space left by a missing tooth to help secure the teeth on either side. 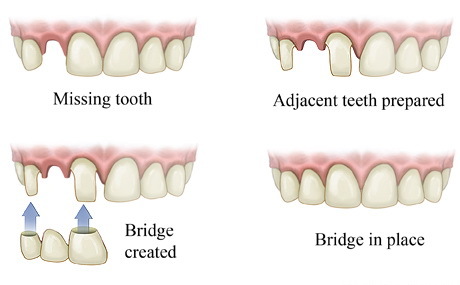 A bridge is comprised of two dental caps that are placed on either side of the space, with a pontic in the middle that replaces the missing tooth/teeth. This dental restoration solution is a fixed and permanent option for those who would like to correct the appearance of teeth. Our staff will perform a thorough exam to help you determine the best solution for oral care. If a dental bridge is a solution you and your clinician agree on, the process can be completed in one day. 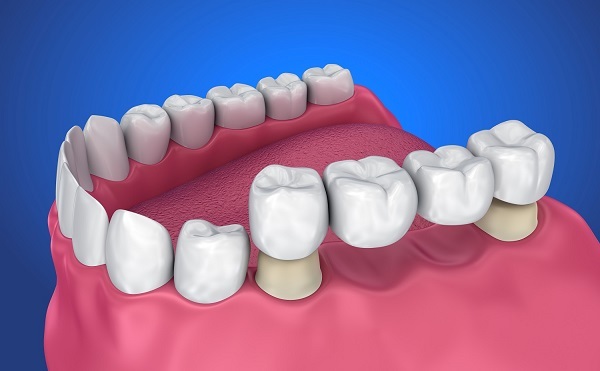 Dental bridges are bonded to your natural teeth that surround the empty space where teeth are missing. The teeth that exist around the empty space serve as anchors for the bridge to be supported. The pontic, replacement tooth, is attached to the crowns that cover the anchor teeth. Saltwater rinses: Add ½ a teaspoon of salt to a cup of warm water and swish around the mouth for 3 to 4 times a day. Rx for pain relief: Your dentist may prescribe medication to help reduce pain. Take as directed. Soft Foods: Stick to consuming foods with a high liquid consistency like soups, pudding and other soft foods. Avoid spicy and sticky foods. Ice Packs: To reduce swelling, apply an ice pack to the outside of your face at the site of the bridge application. Be sure to schedule a follow-up appointment. Contact your physician if you need attention before your scheduled appointment. Also, if any of the following occurs contact your physician. To learn more about whether or not dental bridges are right for you to schedule an appointment with Dr. Mjahed to discuss options.